Palazzo Versace has been on my “must see for myself” list for some time. My partner needed a reward for dealing with the sleepless nights and grumpy outlook that come with launching your own business, while I needed time to chill. If I believed every piece of marketing I’d read about the Palazzo, right then we were made for each other. However, I’m not a Versace man. I wish I was; I like most of the clothes, but they’re just cut for much better-looking and well-proportioned people. 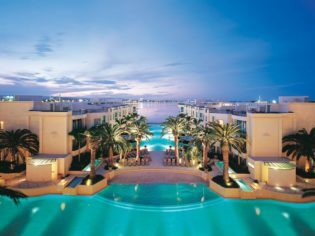 So I booked my stay and wondered: would Palazzo Versace be a better fit? The reception is ornate and vivid. The gold columns, pink marble floors and pastel green sofas should scream “gauche reception” but it doesn’t feel that way. It’s certainly a singular style that may not suit some, but I surprised myself by feeling right at home. The well dressed staff (would you expect anything else?) are warm and welcoming and lack the sort of snootiness that much less luxurious establishments feel is a must-have to be truly elegant. And Palazzo is elegant. After check-in as you’re shown to your room the idea that the Versace touch is as shallow as a teaspoon fades away – it is authentic Versace from start to finish. As we walked the corridors, the wall-mounted pictures were fascinating: a history of fashion according to Versace design. It took some effort to keep my partner from sneaking a few choice fashion shots off the wall to cram into her bag. The room furniture wasn’t the usual “look good for a couple of years before we refurbish” kind. It looked built to last. The ‘basic’ Palazzo room which we got with our excellent web deal was very carefully designed to make as spacious and elegant as possible what is actually not that large a space once all the essentials are packed in – massive king sized bed, mandatory huge spa and separate shower. Now, I know: a hotel room is a hotel room and at a five-star level it sort of becomes indistinguishable. Yet these were immediately different. A spacious spa bath, wide-open benches and Versace cosmetics, all surrounded by good quality fittings and mirrors, with everything bathed in signature Versace gold. It was a very comfortable room with high quality finishings. 1. We secured an excellent rate through the AT website: $350 for the night. Rack rate can be substantially higher. Our room wasn’t one of the best situated, but it made little difference. The best are on the second level facing the pool or marina. 2. Palazzo Versace is often describe as Australia’s only six-star hotel, which isn’t true. The six-star rating doesn’t exist in Australia. Although if it did, I’d be highly surprised if Palazzo didn’t achieve it. 3. Everything in the Palazzo is authentic Versace. The dinnerware, cushions, towels, glasses, bedding, furniture . . . it’s rumoured that $10,000 a month is spent on replacement dinnerware alone! The cushions in the reception area are actually fixed to the sofas so they can’t disappear into a bag. Don’t even think of keeping a small memento like a pillow or robe from your room: you’ll be charged minimum $300 extra. The room was an ideal cocoons from the rest of the world proven by the effort it took me to get my partner to get into her favourite luxury hotel activity – lying by the pool. The Palazzo has three restaurants in total. Il Barocco is the main eatery for the hotel with breakfast in the morning, lunch during the day and a seafood buffet at night. The breakfast has been touted as Australia’s best and it would be very difficult to better it. The seafood buffet is a great way to make sure you stay out of Versace shape. The buffet has all the requisite salads, plus hot meals, prawns, fish, bugs; good quality and fresh, complimented by a strong range of wines. We decided we were elegantly stuffed and couldn’t fit in desert when the waitress convinced us to fill a dessert plate and she’d have it sent to our room with the rest of the wine, plus teas and coffees. Now that’s service. Vanitas is the fine dining restaurant serving dinner from Tuesday to Saturday, bookings recommended. It has a fierce reputation for serving very good quality with an unmatched wine list. Vie is the bar/restaurant and utilises Versace’s position overlooking the marina to serve a la cart dinner and lunch daily. The Palazzo’s Spa Salus Per Aquum is decked out to the Versace standard and will meet most requests. It includes the standard cosmetic and health treatments plus yoga and Tai Chi. Before I arrived I wondered whether the Palazzo was just a marketing gimmick to over-charge for a fairly standard five-star experience. It wasn’t. It’s the perfect retreat in which to cocoon yourself from the rest of the Gold Coast and Australia and enjoy a little well-deserved extravagance and fantasy. There isn’t another hotel in Australia that can invoke such recognition and reaction. Sometimes awe, sometimes inspiration, sometimes aversion bordering on revulsion. It’s a slice of the rockstar and extravagant lifestyle, right here in Australia. And if you time it right with a good package, it really is for everyone.